On this date 110 years ago, Prince Carl of Denmark was elected King Haakon VII of Norway. Suddenly, the younger son of a Danish king became a monarch in his own right -- and his wife, who was the daughter of the British king, became a queen consort. 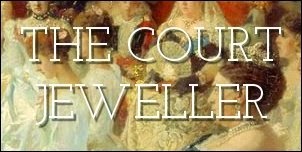 Queen Maud of Norway had a considerable Edwardian jewel collection, much of which is still in the Norwegian royal vaults today. In honor of her husband's election day, we're surveying her roster of tiaras. 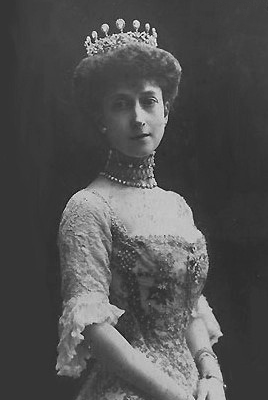 This all-diamond tiara was one of Maud's wedding presents in 1896, and it was one of her most-worn tiaras during her lifetime. She donned it for the coronation of her parents, King Edward VII and Queen Alexandra of the United Kingdom, in 1902, and the wedding of her son, Crown Prince Olav, in 1929. Originally, the top row of diamonds could be swapped out for turquoises, but Maud later repurposed those turquoise pieces. Princess Ragnhild inherited the tiara, but when she died, it was returned to the royal vaults, where it presumably remains today. This teensy-tiny tiara is made in a fan shape -- hence the name vifte. Some have speculated that Maud's eighteenth-birthday present from her grandmother, Queen Victoria of the United Kingdom. Fittingly, she wore it to while in mourning for Victoria in 1901. 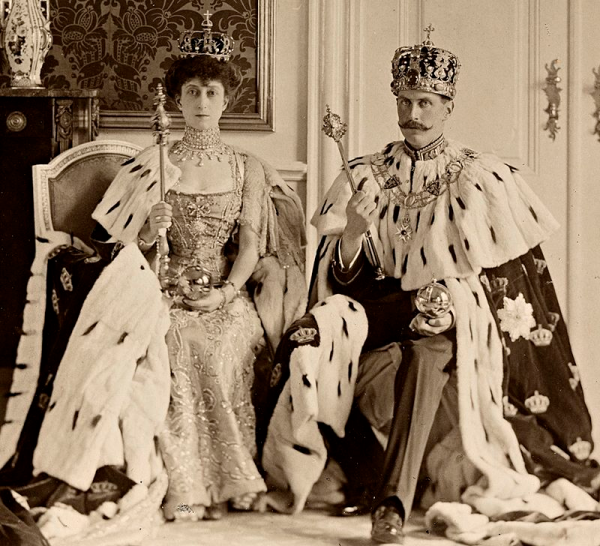 New research, however, suggests that the tiara may have been one of Maud's wedding gifts. King Harald V inherited this tiara, and Queen Sonja has occasionally worn it; Crown Princess Mette-Marit has also worn it as a necklace. 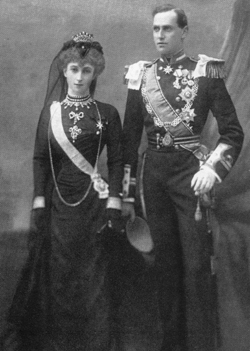 Also of note: the diamond and pearl necklace that Maud wears above (and also above in her coronation portrait) could apparently also be worn as a tiara, though I have never seen a photo of Maud wearing it that way. 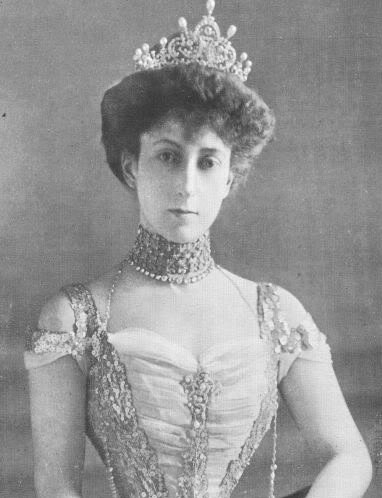 This diamond and pearl tiara was another of Maud's wedding presents. It was an especially versatile piece because it could be worn in either a large or a small setting, King Harald V inherited this tiara, but in the early 1990s it was stolen from Garrard's workshop in London, where it had been sent for cleaning. The tiara was never recovered, and the version of the piece worn today by the Norwegian royal ladies is a replica. When Maud's mother, Queen Alexandra, died in 1925, she left Maud a diamond and turquoise circlet. I've never actually seen a photograph of Maud wearing it, but the piece was later inherited by Princess Astrid, who sports the tiara regularly. Astrid has stated that she will bequeath the tiara back to the Norwegian royal collection on her death, meaning that Maud's tiara collection will remain largely intact within the family vaults. Maud's other major inheritance from her mother was this diamond circlet, which features four Maltese crosses set atop a simple diamond bandeau base. Alexandra had it made as a lighter-weight alternative to the large George IV Diadem (AKA the diadem worn by the Queen today on the way to and from the State Opening of Parliament). The piece originally also had four fleur-de-lis elements, but Maud had those removed. King Harald V inherited the circlet, and Queen Sonja wears the piece in various configurations today.